Regular meetings 3rd Friday of each month, 7:30pm, September-May, except December, San Mateo Garden Center, 605 Parkside Way, San Mateo, CA. Regular meetings 4th Wednesday of each month, September-June, except December, 7pm, Shepard Garden and Art Center, 3330 McKinley Boulevard, Sacramento, CA. 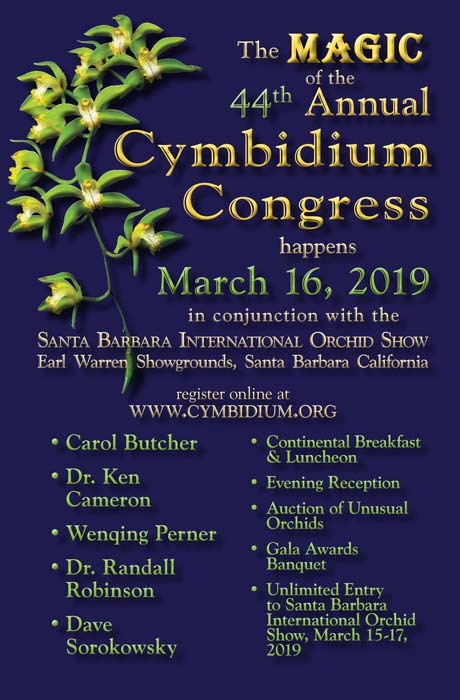 The purpose of the Society is to share information and educate one another in the culture of Cymbidiums, Paphiopedilums and other outdoor growing orchid genera through display, lectures and discussions by knowledgeable orchidologists. The San Diego County Cymbidium Society meets on the third (3rd) Wednesday of the month, except in July, August and December. We meet at the Lake San Marcos Pavilion, 1105 La Bonita Dr., San Marcos, CA 92078. Regular meetings 2nd Wednesday of each month, except March and August, 7:30 PM, Louise Lowry Davis Recreation Center, 1232 De La Vina (at Victoria), Santa Barbara, California. Meets the 1st Tuesday of every month, October – June, 7:30pm at the Grant Elementary School Cafeteria, 2425 Pearl St., Santa Monica, CA.